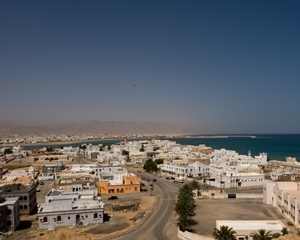 The city of Sur is one of the ancient Omani cities. It is a city that has played a prominent and distinguished role in maritime commercial activity across the Indian Ocean, the Arabian Sea and the Sea of Oman, forming a business and cultural bridge between the Arabian Peninsula, India, South East Asia and Africa. Sur Port is amongst the oldest ports, where more than one hundred and fifty sailing vessels docked daily during the eighteenth and nineteenth centuries. It is the most easterly city in Arabia and the first one to witness sunrise in this part of the world. Sur used to be an important shipbuilding centre of vessels that crossed the oceans. This wilaya has a number of famous ancient monuments, including Bilad Sur Castle, As Sinaysilah Castle, Al `Ayjah Castle, Fanar Ras Al Meel and Ras Al Hadd Castle. It also has a number of valleys, the most prominent being Wadi Shab and Wadi Tiwi, in addition to Ras Al Hadd where the Turtle Sanctuary at Ras Al Jinz lies.